A Puffy-eyed Person Looking at Me in the Mirror! Waking up with puffy eyes can be quite discouraging, especially if your line of work involves communicating with people and getting into close contact often. Then, you are to use your aesthetics in order to better your efficiency at what you do. However, with puffy eyes, both your self-confidence and courage drop drastically, leaving you struggling with things you usually do best. Therefore, even though you are aware that these unwanted apparitions under your eyes will disappear eventually, you would still benefit from a quick fix for this problem. 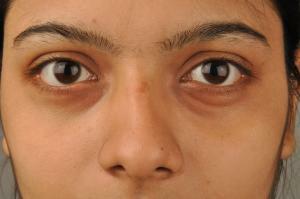 There are several ways of reducing and removing puffy eyes. Nevertheless, it is best to understand the reasons behind them first since this information will help you deal with puffy eyes more easily. There are more than one causes of this facial problem. First of all, most commonly, this is caused by crying. Therefore, if you spend your nights crying, you are likely to have puffy eyes in the morning. Yet, this is not always the case, since there are other causes of this phenomenon as well. Thus, you might not have slept enough the previous night, resulting in these bags appearing under your eyes. Also, you might be suffering from dehydration, which is a state also leading to the appearance of puffy eyes. Finally, puffy eyes may be hereditary or they might be a sign of a certain disease or a harmful condition like, high blood pressure, hormonal imbalances, allergies etc. One of the best cures for this situation is cold application. Namely, exposure to cold reduces the swelling under your eyes, causing the disappearance of puffy eyes in the process. Thus, you may either soak your face in cold water, splash it with cold tap water, or apply soaked cotton balls onto the troublesome spots. Either way, you will notice immediate difference. Secondly, applying herbal tea bags on your eye swellings may reduce them quickly. All you need to do is boil the tea bag, leave it to cool and become warm, and place it onto the spot in question. Alternatively, you might wrap it into a piece of thin cloth. Alternatively, you might place cold slices of potato or cucumber onto your puffy eye parts and experience miraculous regeneration. Fifteen minutes of exposure are claimed to be more than enough for a positive effect. Finally, taking some facts mentioned above into consideration, you should drink sufficient amounts of water in order to ensure your organism is hydrated. This will prevent puffy eyes, if they were caused by dehydration in the first place.